There’s been a lot of fuss recently about Marie Kondo, the Japanese organizer. There have been articles and TV interviews and friends excitedly telling me they’ve been inspired to buy the book. I admit to feeling curmudgeonly about all this hype for something I’ve been doing for the last seven years. It’s just professional organizing in a kimono. Or is it…? I needed to find out for myself. 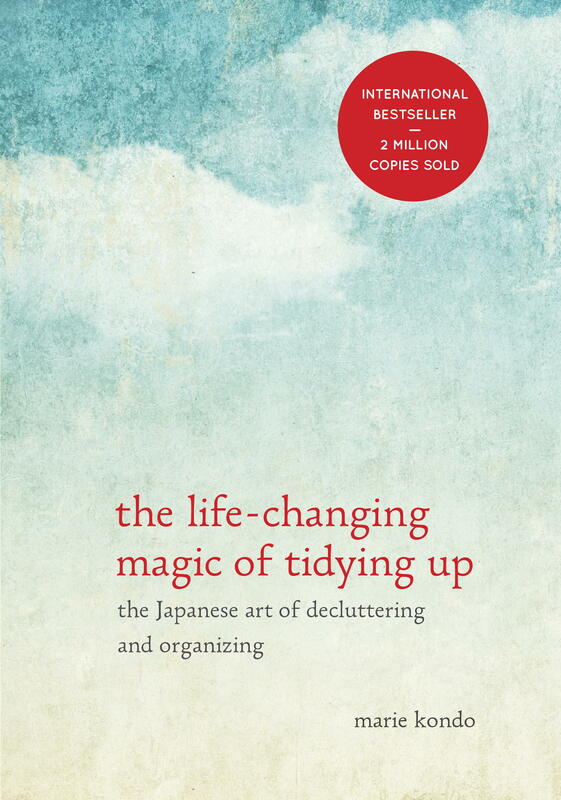 I bought “The Life-Changing Magic of Tidying Up” and read it with an open mind. I was pleased to discover that Marie Kondo’s underlying message is the same as what most professional organizers in the U.S. advise their clients: clearing physical clutter from your environment will help clear the pyschic clutter from your life. While some of her ideas are simplistic and unrealistic, much of what she advocates aligns well with recognized organizing principles. She encourages clients to discard extraneous items, to acknowlege our emotional attachments to objects, to realize that someday never comes, to store like with like, and to keep storage simple by using what you already have. Her set order of dealing with categories makes sense. Clothing decisions have less emotional weight than decisions about mementos, so by the time you get to memorabilia, you will have acquired skills through practice with the easier categories. Tidy (organize) in one shot as quickly as possible. Go through the categories in a set order: clothes, books, documents, miscellany, memorabilia. Kondo claims that this method always works and that her clients never rebound into messiness. She states that the KonMari Method will transform you into an organized person and change your life forever. Kondo’s dogmatic and simplistic approach and firm assurance in her system’s success works in her favor. Her bold positive attitude makes the book an easy and enjoyable read. Her principles are clear and oft-repeated. In videos she is an attractive, engaging personality, always neatly groomed and calm. She presents even some of the oddest techniques so matter-of-factly that one feels bound to try them. I don’t completely agree with some of her ideas. She’s somewhat cavalier about paper – her rule of thumb is to discard everything. She never uses multiple files or writes labels. She doesn’t believe in keeping soaps or shampoos in the shower or on the kitchen sink, but feels they should be carefully dried after each use and stored in a cabinet. Her method of folding clothes is sensible but would be hard for most clients to follow over time, and her storage philosophy, while simple, is strictly “like with like” and ignores location or frequency of use. The idea that strikes me as most odd is her penchant for anthropomorphizing objects and giving them feelings. For example, she disapproves of rolling socks into balls because, “they take a brutal beating in their daily work, trapped between your foot and your shoe, enduring pressure and friction to protect your precious feet.” If they are balled up, “they are always in a state of tension,” and their time in the drawer is their only chance to “rest.” She advocates thanking objects for the job they do for us – after each use and when we discard them – because she feels inanimate objects respond to human emotion. There is a spiritual element to this approach. It may be Kondo’s own personal philosophy or it may have cultural significance, but I believe it can be counter-productive to assign human qualities to objects. Nevertheless, there is plenty of sound advice in an accessible package in “The Life-Changing Magic of Tidying Up.” No matter how good the advice, even Kondo agrees that “people cannot change their habits without first changing their way of thinking.” If Marie Kondo’s charming media presence and slightly unorthodox approach helps someone change their way of thinking and begin to conquer the clutter in their life, it is a very good book indeed.